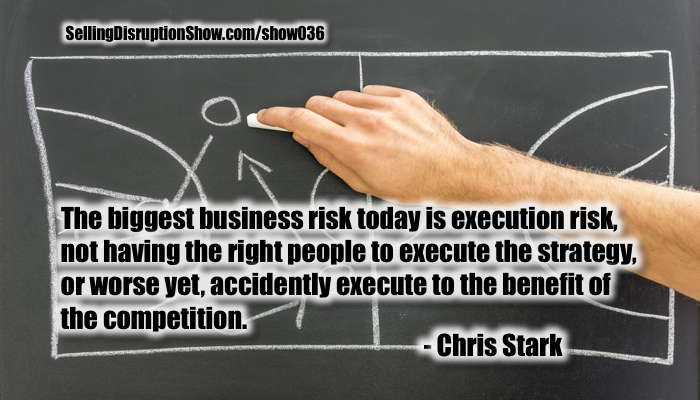 The biggest business risk is execution failure, having the wrong people in the wrong place, preventing success. With the most downloaded episode, Chris Stark is back with more precise insights on deploying disruption. This time we talk about how to select the right people and put them in the right roles to guarantee execution excellence. Chris appears on the most downloaded show. Listen now. Click to download this transcription as a PDF file. Mark S A Smith: My guest today is a repeat. 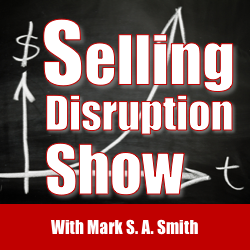 Chris Stark has the most downloads of all time of the Selling Disruption Show, so I have brought him back for even more conversations on how to run a disruptive company, how to deploy disruption. Chris is the practice leader of Strategic Managerial Leadership at the Internal Consulting Group, which is a 21st century consulting company, one of the fastest growing consulting companies in the world. He has deep experience in running organizations that are highly disruptive and helping them grow extremely rapidly. Today, we’re going to talk about some of the management characteristics and management tools that you can use, because if you’re going to run an intentionally disruptive company, you must select the right management team with the right competencies and skills, and the ability to learn how to disrupt. Welcome, Chris Stark. Chris Stark: Glad to be back. Mark S A Smith: Chris, your last show really rattled a lot of chains and got people thinking. On this show, let’s talk about how you select the right people. Chris Stark: First of all, we’ll talk about people’s temperament and how you can match that to a job. Second of all, we’ll talk about mindset and how the more common that is overall, then the tighter your ship runs, the tighter your culture will be. Then, finally, it’s this uber instrument … The others is to support, but can never replace … called the ASSESS battery where you get into very precise understanding, very precise scales about thinking style, working style, and relating style, and this is must have information. Mark S A Smith: So do you consider that a baseline for everybody in the organization to figure out how they fit? Chris Stark: I use it. I use it to support this uber assessment called ASSESS. I use it just as a cross-reference and it gives me a little bit more information. But for those people who think that is the beginning and the end of it, they’re just not seeing anything close to the full picture of what these things can provide. Mark S A Smith: Well, based on our conversations, you find that you use DISC to help create a balanced team. Chris Stark: Indeed. In terms of temperament, because D is for dominance, for instance, and that is about challenging the status quo. Chris Stark: The dominance piece of this is about challenging the status quo because you’re never satisfied with status quo even if it’s iterative. The next go around, you’re still not going to be satisfied when it hits that dominance button and the need for that. The influencing button is a horse of a different color and it’s about being able to take a message you believe in, maybe from the dominant person who you respect and they have some ideas. Now they need to be able to advance that and be able to articulate that to a number of different kinds of audience, whatever audience is necessary. Mark S A Smith: That also explain this you and I again, we are both high influencers; also, that’s required for a sales team. Chris Stark: It is in certain roles. To be a front-end sales person, you do need this, because having the high influencing allows you to pick up on body language, body expressions, words and their meaning, tone and all that. Whereas if you don’t have that high influencing factor, you’re not going to pick that up usually because you’re not looking people in the face all the time and you can’t pick up facial expressions if you’re not looking at someone, right? Mark S A Smith: Right. That’s how we read minds. Chris Stark: That’s how we read minds. However, if you’re a sales engineer where you’re just working with your own team, you don’t need to have that strength. In fact, it allows you to have enhanced other strengths. Mark S A Smith: There’s an old story about sales engineers, what’s the difference between engineer and a sales engineer, and that is that a sales engineer, when he talks to you, he looks at your shoes. Chris Stark: Well, there it is, looking at people’s shoes is not the way we want our salespeople to act, right? Mark S A Smith: That’s why we have to pick them right. We have to pick the temperament to match the role. You’re right about that. Chris Stark: That’s correct. Based on the two ones we’ve talked about already, if you’re a high D and a high I, that allows you to be more comfortable in the behaviors that are required and the way you go about doing things of a hunter. A hunter salesperson. Mark S A Smith: Right, so what you’re implying then is somebody is uncomfortable in sales, they probably are a low D or a low I.
Chris Stark: Well, not as a hunter in sales, but they can maintain the relationship. Hunters always want to hunt new game. 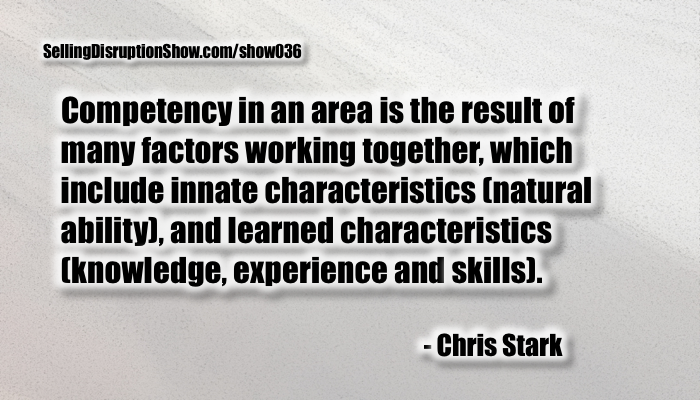 Chris Stark: But if they’re working with people who aren’t at the same level of dominance, they’re more likely to be able to hold on to that relationship because their steadiness factor is high. That means that they can keep engaged at a close level with the customer and just keep building that relation incrementally and maintain that relationship. Those are the kind of people that can make suggestions along the way once they built a relationship, and this is where you can get your cross selling or add on selling, and that sort of thing. Chris Stark: Yes, and that’s been characterized as being a farmer. There’s some other characterizations, but it’s all about being patient in developing your crop. Mark S A Smith: That’s it. Chris Stark: The last factor in D-I-S-C is Compliance, and these are people you need to be your troubleshooters, your quality control folks because these are the people that make sure that the idea is coming from the Dominant folks, which are translated into language of all sorts, word selection, body language, and tone, they’re the ones that make sure that and the S’s who put process in place, they make sure there’s quality control standards. They’re going to get things written down and they can compare the result against what’s been written down. That’s how DISC works. It actually reflects work flow from D to C. Then it comes back around and it’s time for the D again, then it sweeps across the D-I-S-C again. That’s an iterative process, which is what they’re really talking about when they say continuous improvement. Chris Stark: That’s from a temperamental point of view. Mark S A Smith: So we can use the D-I-S-C instrument to help select people in those four areas with complimentary temperaments as the work flow moves. You need to have somebody who’s high D to initiate the changes and they create a disruption … Ha, the D could be for Disruption … we have to have the I to sell it to the rest of the team, you have to have the S to put the processes into place, and you have to have the C to make sure it’s all working. Chris Stark: Yes, that’s correct. I would call it an iterative cycle because it flows from D, I, S, C and then you’ve got work from inception to execution, but it doesn’t mean it can’t be right the first time. Things have to get better and better and better. It loops back into the D and goes right into the D-I-S-C again. Now the results are better, if you have the right team, and then it keeps looping until you get close to perfection. Mark S A Smith: Yeah, interesting. Chris Stark: Perfection’s just a word so you’d never get there. Mark S A Smith: Yeah, right. Chris Stark: But the closer you get, then the more quality and the more effective the product and product service offering is. Mark S A Smith: I think it’s really fascinating. Is there are a DISC profile that maps to somebody who does sell disruptive products well? Chris Stark: Well, there is and that’s the high DI like you and I are talking about. These people have low steadiness factors, which means they lose track of what’s currently the processes that are going on and that allows them to get “outside the box.” In fact, too often, they are living outside the box. Chris Stark: Even during times when they should be supporting what’s in the box. Mark S A Smith: That’s very interesting. A low S, low Steady is somebody who is out of the box. Mark S A Smith: I like that definition. Chris Stark: They’re so kind of hyper that they can’t stay on a linear process. Every time that you talk on a similar topic, they say it differently and you’ve seen this in yourself and other people. Mark S A Smith: Sure. If we have a manager who’s saying to their team, “Folks, we’ve got to think outside of the box,” they’d probably have a bunch of people with high S’s. Chris Stark: Very likely. First of all, you need to know each of your players in terms of their temperament because if you’re the kind of person you and I are, this comes naturally to us. Usually we’re going to be putting out a lot of ideas but at some point we have to stop, slow everything down and then ask those people what the higher steadiness factor and the higher compliance factors to make a contribution. You can’t rush them. Usually when a dialogue has gone far enough along, then they will chip in some things, which often are the first order. Maybe the most determinant things as to whether we’re going to have success. Mark S A Smith: Oh, interesting. Well, because they create a repeatable process then. Chris Stark: And the quality control, and that’s ever evolving. Mark S A Smith: Very interesting. You recommend for an organization that everybody has a DISC profile done and then use some insight to help select the right temperament for the right role to enhance and accelerate disruptive deployment. Chris Stark: Right. So, you’re mapping somebody’s temperament and you can even say their graphical representation of their D, their I, and their S, and C from a scale 1 to 100 against the requirements of the job on that same scale. Chris Stark: The more the picture matches the job, the better off you are. Mark S A Smith: We’ve been talking about DISC as a baseline for everybody in the organization. What’s the next level that you would work with as far as an assessment to take us up a level of cognitive power and understanding of how to put together the ultimate team? Chris Stark: One of the legacy instruments that I have used is called the Business Motivators. Mark S A Smith: Tell me more. Chris Stark: When the motivators, which is about preference for certain types of works, certain kinds of work that support different attitudes, right, when you have that and you have the right temperament, then you know a lot more about the fit than with either instrument alone. I mean, it’s synergistic. It’s not one on one. It’s like four to five times more useful than just one of the two alone. Now the Biz Motivators, Business Motivators Instrument is about how you rank in relative terms across six different dimensions, like what we would say from left to right, they are a conceptual dimension which can be measured after a questionnaire is answered on a scale of 1 to 100. Then there’s another one that’s called the Economic Value and that is on a scale from 1 to 100 is how much are you wanting to leverage your time, money, and resources. The next scale is an artistic scale, which is called the Aesthetic Value and, again, it’s on a scale of 1 to 100. The higher you go, the more you have of this quality. Then it gets into the social value, which is not partying, unfortunately. It’s the empathy value where your heart goes out to the needs of other people. Next to that is the power value, and this is the “me, myself, and I” value. Very often those dimensions are compared to one another to see what the win-win situation. Everyone talks about the win-win, but sometimes if you have a high power quotient, your W is in a 40 font. Chris Stark: If you really are not concerned about other people’s agenda, that might be, say, when in a 10 font, if you know what I mean. Chris Stark: If you really want win-win scenarios, those fonts need to be about the same size. Mark S A Smith: I love that analogy. That’s really great. Is my win bigger than your win? Chris Stark: That is correct. It comes out in many different ways. If somebody’s ego or their power, value is way higher than social value. Or the social’s way higher than the ego value, which means as a leader, you’re putting everyone else’s needs before your own. As a leader, you really can’t afford to do that. Mark S A Smith: Mm-hmm. It’s got to be balanced. Chris Stark: Because you’re the one that has to put the standards somewhere and rally the troops around that. There’s one more. It’s about regulations. It’s about business conforming, and that is about essentially doing things the way you’ve always done before. That one is often compared to the conceptual value. The conceptual value is you want to learn new ways of doing things that are more productive. Mark S A Smith: Inventive, disruptive. Chris Stark: The business one is more reflective. It’s not about looking into the future. It’s relying on the past. Very often if you’re trying to talk to somebody about a new way of doing something and then they have this high business roles thing, it’s like talking to a bedpost. It just doesn’t work. You have to find another way to convey it to them. Mark S A Smith: When you look at these six that you shared with me: conceptual, economic value, aesthetic, empathy, power, and regulation, the very successful leaders of massively disruptive companies score high on all six of this axis. Chris Stark: You’ve got to remember, Mark, that when you’re looking at these six values, it’s a zero-sum game. Mark S A Smith: Oh, okay. Chris Stark: Right. You’re going to have 300 points out of 600 points regardless. So, the higher one value is, the lower other values are to make up for that. Chris Stark: Yes. This is not something fluid. This actually is about somebody’s mindset, which can be changed and it does change over time from when we were young to older. We start valuing different things in different proportions than when we were young and really trying to make a name for ourselves in many cases and trying to make as much money as possible. That in retirement, we’re in repose, all that stuff’s behind us, and now those values change when you’re a grandparent or a parent. That’s more of an empathy value for the people around you. Mark S A Smith: These are going to change based on role responsibility and where you are in your life cycle. Chris Stark: Well, it is all that. I think what’s important to know is that you can determine what a department’s overall mindset is or even what an overall organization’s mindset is across these six values. I’ll give you just a couple of examples. One is if you’re a non-profit organization, the economic value is not preeminent. However, if you’re working in private industry where return on investment, return on assets, percentage of profitability, these are things that need to be high. If they’re low, it’s going to be a misfit. Even if you have perfect temperament, if you’re not fit to the needs of the company in terms of how it expresses itself over these six dimensions, you’re not going to be a fit. You belong in some other culture. Mark S A Smith: Very interesting. How do you use the Business Motivators in your work with your clients? Chris Stark: Well, we know by position what kind of motivators are going to fit the best. If you’re in a disruptive sell mode, we know that you’re going to have a higher conceptual interest than a regulatory interest. Chris Stark: You know that you’re going to be a higher economic person and probably lower on what we call the artistic value because the economic value is about ROI and let’s just unbundle that. ROI is Return On Investment, but people who are aesthetic, they want the experience right now. They don’t want to delay their gratification, which is about the economics. You invest your energy, time, and money and then you get a bigger result later on. Does that make sense? Mark S A Smith: Sure it does. Chris Stark: Getting back to it, there is a corporate mindset, sometimes a departmental mindset that might be a little bit different. Let’s say it’s the marketing department or the engineering department as opposed to the sales department. But each culture’s going to have some of these things that are pronounced. The best scenario is where you have somebody whose temperamental representation in the form of DISC matches the role. You really want a lot of diversity across D-I-S-C and the requirements of any given departmental type of job. In the other area, you want, for the most part, common mindset. It’s almost like the Marines, and there’s many others that describe this in a similar way, but many are called but few are chosen. The ones who are chosen fit this very type of mindset of this brotherhood and you hear Marines talking about once a Marine, always a Marine. Chris Stark: That’s about mindset that’s crystallized. Mark S A Smith: Interesting. Then you like to use the ASSESS tool as you go higher up the organization. Chris Stark: Yeah, that is the case. These are good communication tools, these are good for parts that fit to a role and a culture. We’re talking role and culture right now. Mark S A Smith: Ah, yes. Chris Stark: Now, we’re going to talk about some very important personality traits that don’t show up. They show up in the ASSESS battery on scales of 1 to 10 but you don’t find them in other instruments. If you recall, I mentioned to you earlier that this is the only assessment I know of that was originally put together to represent the evaluations of strong industrial psychologist and their evaluations of people across the same dimensions. Interesting thing about this is that tool was originally created to test the competency of newly minted industrial psychologists. What I mean by that is that the industrial psychologist, the newly minted one, would evaluate a client in terms of these factors and they come up with their scores and comments on a scale of 1 to 10 across all these dimensions, like 25 of them. Well, then that person, that same client, would take the ASSESS battery which they created for this testing process initially and they compared the evaluations and the values on these scales by the newly minted industrial psychologist, and they compare it against the assess scores for the same person. The further away they got from the assessed scores, the more off they were. They were off. It’s not like they took the assessment compared to the evaluations. It was the other way around. Then the people who created this instrument, really bright guys, said, “You know, there’s a bigger use for this.” What we’re doing, what they came to understand was that you can go a long way to mirroring the evaluations of a seasoned industrial psychologist at a fraction of the price. Mark S A Smith: These tests are not very expensive compared to having professional come in, and yet you can then bring the professional at the right point so you really can get the most out of the industrial psychologist helping you form a perfect team. Mark S A Smith: It was grueling. Chris Stark: … two days. If you can imagine how much an industrial psychologist charges by the hour. We’re talking thousands of dollars, three to five thousands of dollars. In some cases, even more. With this instrument, you put in the data. It gives you the answers, the same scoring on the same scales, and it truly is at a fraction of the cost. Mark S A Smith: Well, that’s a very inexpensive investment to find out if somebody you’re going to bring is going to tank the company or take them where you want to go. Mark S A Smith: I did. Chris Stark: …a while back. Mark S A Smith: …in how to improve. Chris Stark: It is prescriptive, Mark. It’s very good word. It’s not a shotgun approach by any means. It is laser-focused. It laser focuses on things that may be outside the scales, the norms for a given trait and, of course, the further out you are, then the more important it is to start developing yourself. All these stuff from the ASSESS battery is changeable. Some are going to be harder to change because they tend to be more innate, and others, which are primarily learned, then those are much easier to change. Mark S A Smith: With innate, we still get to, as you pointed out, we go through the awareness, choice and change process that we can take. Even if it’s innate, we still can make some differences, but it’s just that we have to make the choice that, “Well, that was a fun trait to have in the past. It’s not serving me or what I want to do. It’s holding me back from meeting my goals.” I think that’s a really powerful awareness piece that I really appreciated in this exercise that we went through. Chris Stark: One of the things I like interacting with you, Mark, is you’re quite forthcoming. But then, again, on a scale of 1 to 10, a couple of these scales are some of the traits I am really interested in. One is criticism tolerance and that is actually at one is you’re incredibly thin skinned. It means people need to be careful how they say things to you and that sort of thing. Mark S A Smith: Yeah, you’ll burst into tears if somebody doesn’t look at you right. Chris Stark: You’ll just freeze up and sometimes for quite a while. Then on the other side, then you have very thick skin and you can take it no matter what you’re told. You see it as positive critique as opposed to damaging criticism. Mark S A Smith: Right, versus, attacking that naturally as an author, as a speaker, as somebody who writes a lot of articles, I have to have a thick skin because I tell you, Chris, in every audience, there are people that are looking to be offended. Chris Stark: You certainly face it in the work that you have expertise in. Another traits that’s a really important for me in terms of building organizations is frustration tolerance, where on a level of one, two, or three, which is outside the ideal zone for this trait, you are going to be stopped by the smallest things that should not stop you. The problem is, if you get frustrated and stop, you’re usually going to need the help of somebody else, often your boss, to get you back on track. Chris Stark: Who wants to be constantly propping up people because they’re so easily frustrated? Mark S A Smith: We don’t need that. Chris Stark: What they need are people that are highly frustration tolerant, maybe in the 6 to 10 range. So, they just keep going and they don’t need a lot of maintenance. They’re low maintenance as opposed to high maintenance. Mark S A Smith: So interesting. So, you’re tying the frustration range to high maintenance. I had not made that connection before. It makes all kinds of sense. Chris Stark: Yes. Well, thanks for that. Chris Stark: There’s another scale that I think is really important. Particularly, if you’re in a disruptive mode, you can’t just be operating off your brainstem. I hate to say it quite that way. You can’t be quickly and reactive in a cognitive sort of way. You have to factor in people and things and the complexity of what you’re talking about, and some people have that capability. Part of this is innate. This is one that has a lot of innate qualities to it. But if you’re reflective at a high level, that means you’re not going to fall for the first or simplest solution around. We are trying to create the future. You can’t make snap judgments. You just can’t do it. Chris Stark: Incidentally, you prefer that kind of trait when we’re talking about people who are on the line, working on things. They have to make snap decisions. They can’t ponder the problem while the darn assembly line is moving forward. Does that make sense? Chris Stark: Once you’re on the C-suite, you just cannot think that way. You have to be able to reflect on everything that’s happening. For somebody who runs a large global corporation, they have to think about the economy. Not one of the economy of the U.S. if they’re U.S.-based, but economy of the area where they’re trying to conduct business. It could be what they call EMEA, which is Europe and Asia. It could be the Americas, Latin America. It could be any of these larger areas that can form to a different sort of governmental government. It could be nation by nation in many cases. So that’s something you have to factor in. Something else you have to factor in is the politics of these various places. Chris Stark: Politics, regulations are involved there. The culture is another big one, Mark. Chris Stark: When you say global, you’re talking a lot about the interaction of lots of different kinds of these things we talked about. It requires a ton of reflection and the ability to reflect on very complex matters that are all moving in their own different to make judgments about what the overall organization is going to do and then what might they do in regions of the world and then what they might do in some specific nations. It takes a lot of comprehension and a lot of intelligence and cognitive power to deal with all those. Mark S A Smith: That’s right. That’s why I like to say that executives have more on their to-think list than on their to-do list. Chris Stark: That’s very well said. I haven’t heard that, but it’s entirely true. Mark S A Smith: Way more think power than do power. This has really been a great conversation, Chris. Unfortunately, we’ve come to the end of the show. How can we pull together these ideas about doing assessments to improve people’s ability to deploy disruption? Chris Stark: There are a lot of assessments out there. There are things like Myers-Briggs or things like Predictive Index. There’s any number of value preferences and that sort of thing. There are cognitive tests, there are tests for mental bandwidths, and there are tests for discernment and the like. If somebody’s interested in this stuff, I certainly have the way I think is best. Shall I talk to that? Mark S A Smith: You have a lot of experience selecting test to avoid disruptive companies. Chris Stark: Well, that is very true. I have taken myself through dozens of test. The main reason is not to learn about what I already know about myself. Mark S A Smith: Find your blind spots. Chris Stark: Yeah, to find out what I intuitively know about myself that has not been revealed. Chris Stark: The best tools I have ran across are the DISC assessment, which is about temperament, the Mindset instrument, which is the business motivators, and then on top of all that, the uber ASSESS battery, which gets into these scales that none of the others that I have seen do as good a job at, because it not only measures them, but it puts them in ranges, and these ranges change for various type of roles. It’s going to be different if you’re going to be a team member. It’s going to be different if you’re an individual contributor. It’s going to be different if you’re a manager or sales manager, and all that is going to be different than if you’re an executive. There’s a lot of overlapping areas of competence, but there are other that are specific to the type role we’re talking about. Mark S A Smith: Excellent. Those are the three. What’s the best way for our listener to learn more about these assessment tools? Chris Stark: Mark, our listeners can find out more about thus by going to our website AssessMax.com. They can see information and samples of assessments that we use. 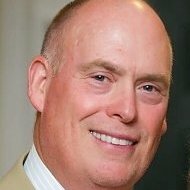 Chris Stark: For those who really are interested, contact me and we can have some conversation about it. Then, later on, if thing seem to be match, then I can allow them to test it, maybe take it on themselves or somebody that trusts them and they know very well or think they know him very well, and have him take the assessment and see how well it matches and what new information comes up that maybe they had an intuition about or did not that adds value to how they perceive somebody for a new hire, for putting on a team, for promotion, and for succession planning. Mark S A Smith: If you are the executive at your company and you’re responsible for P&L and you’re responsible for putting together the team that’s going to make all that happen, Chris has this amazing knack for taking extremely complex information and communicating in a way that people understand and can act upon. Have a conversation with Chris. He’s a great guy, as you can tell. He’s extremely intelligent and really understands how to build and deploy disruption. Thank you, Chris, for being a great guest and sharing your insights and wisdoms and improving the cognitive capacity of our listener. Chris Stark: Thanks a lot, Mark. You know I’m always available for you.